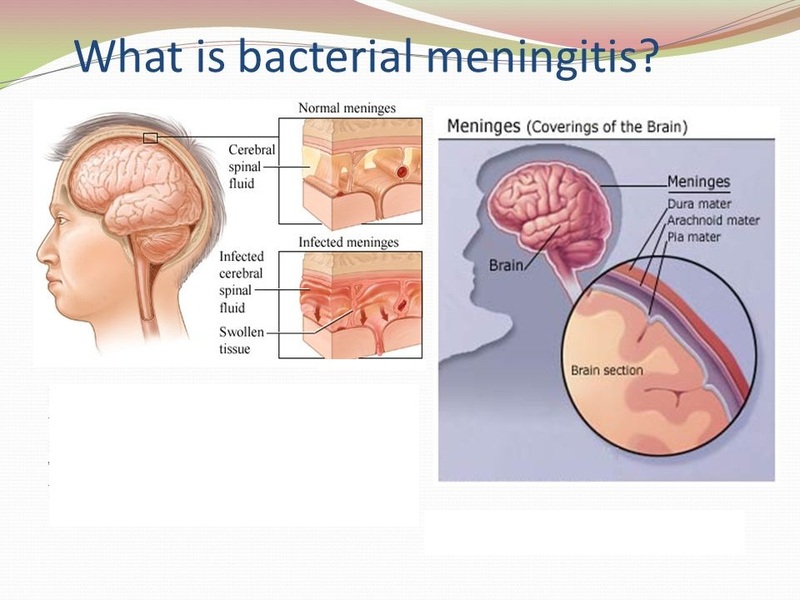 Meningitis is an infection of the membranes (meninges) surrounding the brain and spinal cord. Meningitis can be caused by a bacterial, fungal or viral infection. Meningitis can be acute, with a quick onset of symptoms, it can be chronic, lasting a month or more, or it can be mild or aseptic. Anyone experiencing symptoms of meningitis should see a doctor immediately. Acute bacterial meningitis is the most common form of meningitis. Approximately 80% of all cases are acute bacterial meningitis. Bacterial meningitis can be life threatening. The infection can cause the tissues around the brain to swell. This in turn interferes with blood flow and can result in paralysis or even stroke. Bacterial meningitis is very serious and can be deadly. Death can occur in as little as a few hours. Most people recover from meningitis. However, permanent disabilities (such as brain damage, hearing loss, and learning disabilities) can result from the infection. On average, bacterial meningitis caused about 4,100 cases and 500 deaths in the United States each year between 2003 and 2007. Most cases of meningitis in the U.S. are caused by a viral infection, but bacterial and fungal infections are other causes. Some cases of meningitis improve without treatment in a few weeks. Others can be life-threatening and require emergent antibiotic treatment. Children between the ages of 1 month and 2 years are the most susceptible to bacterial meningitis. Adults with certain risk factors are also susceptible. You are at higher risk if you abuse alcohol, have chronic nose and ear infections, sustain a head injury or get pneumococcal pneumonia. You are also at higher risk if you have a weakened immune system, have had your spleen removed, are on corticosteroids because of kidney failure or have a sickle cell disease. Additionally, if you have had brain or spinal surgery or have had a widespread blood infection you are also a higher risk for bacterial meningitis. Outbreaks of bacterial meningitis also occur in living situations where you are in close contact with others, such as college dormitories or military barracks. It is important to follow the recommended vaccination schedule to prevent meningitis. H. influenzais the main cause of bacterial meningitis in children under 5 in countries that do not offer the Hib vaccine. The bacteria most often responsible for bacterial meningitis are common in the environment and can also be found in your nose and respiratory system without causing any harm. Sometimes meningitis occurs for no known reason. Other times it occurs after a head injury or after you have had an infection and your immune system is weakened. Older adults:Streptococcus pneumoniae, Neisseria meningitidis, Haemophilus influenzae type b (Hib), group B Streptococcus, Listeria monocytogenes. Listeria monocytogenes (listeria). These bacteria can be found in unpasteurized cheeses, hot dogs and luncheon meats. Pregnant women, newborns, older adults and people with weakened immune systems are most susceptible. Listeria can cross the placental barrier, and infections in late pregnancy may be fatal to the baby. Slow-growing organisms (such as fungi and Mycobacterium tuberculosis) that invade the membranes and fluid surrounding your brain cause chronic meningitis. Chronic meningitis develops over two weeks or more. The symptoms of chronic meningitis — headaches, fever, vomiting and mental cloudiness — are similar to those of acute meningitis. Fungal meningitis is relatively uncommon and causes chronic meningitis. It may mimic acute bacterial meningitis. Fungal meningitis isn’t contagious from person to person. Cryptococcal meningitis is a common fungal form of the disease that affects people with immune deficiencies, such as AIDS. It’s life-threatening if not treated with an antifungal medication. Skipping vaccinations.Risk rises for anyone who hasn’t completed the recommended childhood or adult vaccination schedule. Most cases of viral meningitis occur in children younger than age 5. Bacterial meningitis is common in those under age 20. Living in a community setting.College students living in dormitories, personnel on military bases, and children in boarding schools and child care facilities are at greater risk of meningococcal meningitis. This is probably because the bacterium is spread by the respiratory route, and spreads quickly through large groups. Pregnancy increases the risk of listeriosis — an infection caused by listeria bacteria, which also may cause meningitis. Listeriosis increases the risk of miscarriage, stillbirth and premature delivery. Compromised immune system.AIDS, alcoholism, diabetes, use of immunosuppressant drugs and other factors that affect your immune system also make you more susceptible to meningitis. Having your spleen removed also increases your risk, and patients without a spleen should get vaccinated to minimize that risk. Wash your hands.Careful hand-washing helps prevent germs. Teach children to wash their hands often, especially before eating and after using the toilet, spending time in a crowded public place or petting animals. Show them how to vigorously and thoroughly wash and rinse their hands. Practice good hygiene.Don’t share drinks, foods, straws, eating utensils, lip balms or toothbrushes with anyone else. Teach children and teens to avoid sharing these items too. Stay healthy.Maintain your immune system by getting enough rest, exercising regularly, and eating a healthy diet with plenty of fresh fruits, vegetables and whole grains. Cover your mouth.When you need to cough or sneeze, be sure to cover your mouth and nose. If you’re pregnant, take care with food.Reduce your risk of listeriosis by cooking meat, including hot dogs and deli meat, to 165 F (74 C). Avoid cheeses made from unpasteurized milk. Choose cheeses that are clearly labeled as being made with pasteurized milk. Blood cultures. Blood samples are placed in a special dish to see if it grows microorganisms, particularly bacteria. A sample may also be placed on a slide and stained (Gram’s stain), then studied under a microscope for bacteria. Imaging. Computerized tomography (CT) or magnetic resonance (MR) scans of the head may show swelling or inflammation. X-rays or CT scans of the chest or sinuses may also show infection in other areas that may be associated with meningitis. Spinal tap (lumbar puncture). For a definitive diagnosis of meningitis, you’ll need a spinal tap to collect cerebrospinal fluid (CSF). In people with meningitis, the CSF often shows a low sugar (glucose) level along with an increased white blood cell count and increased protein. Haemophilus influenzae type b (Hib) vaccine.Children in the United States routinely receive this vaccine as part of the recommended schedule of vaccines, starting at about 2 months of age. The vaccine is also recommended for some adults, including those who have sickle cell disease or AIDS and those who don’t have a spleen. Pneumococcal conjugate vaccine (PCV13).This vaccine also is part of the regular immunization schedule for children younger than 2 years in the United States. Additional doses are recommended for children between the ages of 2 and 5 who are at high risk of pneumococcal disease, including children who have chronic heart or lung disease or cancer. Pneumococcal polysaccharide vaccine (PPSV23).Older children and adults who need protection from pneumococcal bacteria may receive this vaccine. The Centers for Disease Control and Prevention recommends the PPSV vaccine for all adults older than 65, for younger adults and children age 2 and up who have weak immune systems or chronic illnesses such as heart disease, diabetes or sickle cell anemia, and for those who don’t have a spleen. Meningococcal conjugate vaccine.The Centers for Disease Control and Prevention recommends that a single dose be given to children ages 11 to 12, with a booster shot given at age 16. If the vaccine is first given between ages 13 and 15, the booster shot is recommended between ages 16 and 18. If the first shot is given at age 16 or older, no booster is necessary. This vaccine can also be given to younger children who are at high risk of bacterial meningitis or who have been exposed to someone with the disease. It’s approved for use in children as young as 9 months old. It’s also used to vaccinate healthy but previously unvaccinated people who have been exposed in outbreaks. Corticosteroids: These may be given if inflammationis causing pressure in the brain, but studies show conflicting results. Acetaminophen, or paracetamol:Together with cool sponge baths, cooling pads, fluids, and room ventilation, these reduce fever. Anticonvulsants:If the patient has seizures, an anticonvulsant, such as phenobarbital or Dilantin, may be used. Sedatives:These will calm the patient if they are irritable or restless. Blood tests may be used to monitor the patient’s levels of blood sugar, sodium, and other vital chemicals.